Anatomically, the oropharynx is located between the soft palate superiorly and the hyoid bone inferiorly; it is continuous with the oral cavity anteriorly and communicates with the nasopharynx superiorly and the supraglottic larynx and hypopharynx inferiorly. Base of the tongue, which includes the pharyngoepiglottic folds and the glossoepiglottic folds. Tonsillar region, which includes the fossa and the anterior and posterior pillars. Soft palate, which includes the uvula. Posterior and lateral pharyngeal walls. Level I contains the submental and submandibular lymph nodes. Level II contains the upper jugular lymph nodes, which are above the digastric muscle. Level III contains the mid-jugular lymph nodes, which are between the omohyoid muscle and the digastric muscle. Level IV contains the lower jugular lymph nodes. Level V contains the lymph nodes of the posterior triangle. The base of the tongue (47%) and the tonsil (46%) were the most common primary sites. Most patients had stage T1 to T2 primary tumors (64%) and stage III to IVB disease (94%). The incidence of radiographic retropharyngeal-node involvement was 10% and was highest for the pharyngeal wall (23%) and lowest for the base of the tongue (6%). Retropharyngeal lymph-node involvement was associated with inferior 5-year local control and inferior recurrence-free survival, distant metastases-free survival, and overall survival on multivariate analysis. Refer to the PDQ summary on Oral Cavity and Oropharyngeal Cancer Prevention for more information. HPV-positive oropharyngeal cancers may represent a distinct disease entity that is causally associated with HPV infection and is also associated with an improved prognosis. Several studies indicate that individuals with HPV-positive tumors have significantly improved survival. [12,15,16,17] In a prospective study involving 253 patients with newly diagnosed or recurrent head and neck SCC, HPV was detected in 25% of the patients. Poor tumor grade and an oropharyngeal site independently increased the probability of the presence of HPV. Oropharyngeal tumors are more likely to be HPV positive (57%) compared with oral cavity (12%) tumor sites and nonoropharyngeal (14%) sites. HPV-positive oropharyngeal cancers predominantly arise in the palatine or lingual tonsils. For tonsil or base-of-tongue sites, 62% of tumors were HPV positive, compared with 25% for other oropharyngeal sites. The risk of developing a second primary tumor in patients with tumors of the upper aerodigestive tract has been estimated to be 3% to 7% per year. [18,19] Because of this risk, patients require lifelong surveillance. Smoking and alcohol consumption after treatment are associated with the development of second primary tumors of the aerodigestive tract. [20,21,22] Patients may need counseling to discontinue smoking and alcohol consumption. A comparison of patients (N = 2,230) with index SCC of the oropharynx site and index SCC of nonoropharyngeal sites (i.e., oral cavity, larynx, and hypopharynx) was performed to determine the likelihood of developing second primary malignancies. The second primary malignancy rate was lower for patients with index oropharyngeal SCC than for patients with index nonoropharyngeal cancer (P < .001). Among patients with oropharyngeal SCC, former smokers had a 50% higher risk of second primary malignancy than never-smokers, and current smokers had a 100% higher risk than never-smokers (P trend = .008). These data suggest that patients who fit the typical HPV phenotype have a very low risk of second-primary malignancy. The chewing of betel quid, a stimulant preparation commonly used in parts of Asia, increases the risk of oropharyngeal cancer. Defective elimination of acetaldehyde, a carcinogen generated by alcohol metabolism. In individuals, primarily East Asians, who carry an inactive mutant allele of alcohol dehydrogenase-2, alcohol consumption is associated with a susceptibility to multiple metachronous oropharyngeal cancers that are caused by the decreased elimination of acetaldehyde. To date, SCC of the oropharynx has not been associated with any specific chromosomal or genetic abnormalities. Genetic and chromosomal aberrations in these cancers are complex. [32,33] Despite the lack of specific genetic abnormalities, testing for genetic alterations or ploidy in early oropharyngeal lesions may identify patients who are at the greatest risk of disease progression and may lead to more-definitive therapy. Tonsil, tonsillar fossa, tonsillar pillars, or glossotonsillar sulci. Base of the tongue (posterior 1/3 of tongue posterior to circumvallate papillae). Soft palate, inferior surface, or uvula. The anterior tonsillar pillar and tonsil are the most common location for a primary tumor of the oropharynx. Lesions involving the anterior tonsillar pillar may appear as areas of dysplasia, inflammation, or a superficial spreading lesion. These cancers can spread across a broad region, including the lateral soft palate, retromolar trigone and buccal mucosa, and tonsillar fossa. [4,5] The lymphatic drainage is primarily to level II nodes. Tumors of the posterior tonsillar pillar can extend inferiorly to involve the pharyngoepiglottic fold and the posterior aspect of the thyroid cartilage. These lesions more frequently involve level V nodes. Lesions of the tonsillar fossa may be either exophytic or ulcerative and have a pattern of extension similar to those of the anterior tonsillar pillar. These tumors present as advanced-stage disease more often than do cancers of the tonsillar pillar. Approximately 75% of patients will present with stage III or stage IV disease. [4,5] The lymphatic drainage is primarily to level V nodes. Tumors of the posterior tonsillar pillar can extend inferiorly to involve the pharyngoepiglottic fold and the posterior aspect of the thyroid cartilage. These lesions more frequently involve level V nodes. A mass in the neck. Clinically, cancers of the base of the tongue are insidious. These cancers can grow in either an infiltrative or exophytic pattern. Because the base of the tongue is devoid of pain fibers, these tumors are often asymptomatic until there is significant tumor progression. Referred otalgia secondary to cranial nerve involvement. Trismus secondary to pterygoid muscle involvement. Fixation of the tongue that is caused by infiltration of the deep muscle. Lymph node metastasis is common because of the rich lymphatic drainage of the base of the tongue. Approximately 70% or more of patients with advanced base-of-the-tongue cancers have ipsilateral cervical nodal metastases; 30% or fewer of such patients have bilateral, cervical lymph-node metastases. 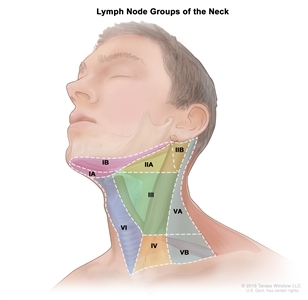 [5,35] The cervical lymph nodes involved commonly include levels II, III, IV, and V and retropharyngeal lymph nodes. Soft palate tumors are primarily found on the anterior surface. Lesions in this area may remain superficial and in early stages. The lymphatic drainage is primarily to level II nodes. Pharyngeal wall lesions can spread superiorly to involve the nasopharynx, posteriorly to infiltrate the prevertebral fascia, and inferiorly to involve the pyriform sinuses and hypopharyngeal walls. Primary lymphatic drainage is to the retropharyngeal nodes and level II and III nodes. Because most pharyngeal tumors extend past the midline, bilateral cervical metastases are common. Leukoplakia is used only as a clinically descriptive term meaning that the observer sees a white patch that does not rub off, the significance of which depends on the histologic findings. Leukoplakia can range from hyperkeratosis to an actual early invasive carcinoma or may represent a fungal infection, lichen planus, or other benign oral disease. The assessment of the primary tumor is based on inspection and palpation, when possible, and by indirect mirror examination. The appropriate nodal drainage areas are examined by careful palpation. The presence of tumor must be confirmed histologically. Any other pathologic data obtained from a biopsy and additional radiographic studies are also considered in the diagnosis. Positron emission tomography-computed tomography scan (PET-CT) scan. Biopsy and p16 testing to assess for HPV status. Smoking history (pack-year smoking history of 10 or more years). Tumor stage and nodal status. The criteria described in Table 1 are used to determine whether patients have low-, intermediate-, or high-risk oropharyngeal carcinoma; they have been defined by using recursive partitioning analysis in a retrospective analysis of a randomized trial of stage III and IV oropharyngeal SCC patients treated with chemoradiation. a Ang KK, Harris J, Wheeler R, et al. : Human papillomavirus and survival of patients with oropharyngeal cancer. N Engl J Med 363 (1): 24-35, 2010. A careful examination of the patient's head and neck allows the physician to look for recurrence every 6 to 12 weeks for the first posttreatment year, every 3 months for the second year, every 3 to 4 months for the third year, and every 6 months thereafter. American Cancer Society: Cancer Facts and Figures 2016. Atlanta, Ga: American Cancer Society, 2016. Available online. Last accessed December 8, 2016. Parkin DM, Bray F, Ferlay J, et al. : Estimating the world cancer burden: Globocan 2000. Int J Cancer 94 (2): 153-6, 2001. Choi WH, Hu KS, Culliney B, et al. : Cancer of the oropharynx. In: Harrison LB, Sessions RB, Hong WK, eds. : Head and Neck Cancer: A Multidisciplinary Approach. 3rd ed. Philadelphia, PA: Lippincott, William & Wilkins, 2009, pp 285-335. Pharynx. In: Edge SB, Byrd DR, Compton CC, et al., eds. : AJCC Cancer Staging Manual. 7th ed. New York, NY: Springer, 2010, pp 41-56. Gunn GB, Debnam JM, Fuller CD, et al. : The impact of radiographic retropharyngeal adenopathy in oropharyngeal cancer. Cancer 119 (17): 3162-9, 2013. Neville BW, Day TA: Oral cancer and precancerous lesions. CA Cancer J Clin 52 (4): 195-215, 2002 Jul-Aug.
Licitra L, Bernier J, Grandi C, et al. : Cancer of the oropharynx. Crit Rev Oncol Hematol 41 (1): 107-22, 2002. Mork J, Lie AK, Glattre E, et al. : Human papillomavirus infection as a risk factor for squamous-cell carcinoma of the head and neck. N Engl J Med 344 (15): 1125-31, 2001. Gillison ML, Koch WM, Capone RB, et al. : Evidence for a causal association between human papillomavirus and a subset of head and neck cancers. J Natl Cancer Inst 92 (9): 709-20, 2000. D'Souza G, Kreimer AR, Viscidi R, et al. : Case-control study of human papillomavirus and oropharyngeal cancer. N Engl J Med 356 (19): 1944-56, 2007. Chaturvedi AK, Engels EA, Pfeiffer RM, et al. : Human papillomavirus and rising oropharyngeal cancer incidence in the United States. J Clin Oncol 29 (32): 4294-301, 2011. Ringström E, Peters E, Hasegawa M, et al. : Human papillomavirus type 16 and squamous cell carcinoma of the head and neck. Clin Cancer Res 8 (10): 3187-92, 2002. Schwartz SR, Yueh B, McDougall JK, et al. : Human papillomavirus infection and survival in oral squamous cell cancer: a population-based study. Otolaryngol Head Neck Surg 125 (1): 1-9, 2001. Ang KK, Harris J, Wheeler R, et al. : Human papillomavirus and survival of patients with oropharyngeal cancer. N Engl J Med 363 (1): 24-35, 2010. Khuri FR, Lippman SM, Spitz MR, et al. : Molecular epidemiology and retinoid chemoprevention of head and neck cancer. J Natl Cancer Inst 89 (3): 199-211, 1997. León X, Quer M, Diez S, et al. : Second neoplasm in patients with head and neck cancer. Head Neck 21 (3): 204-10, 1999. Do KA, Johnson MM, Doherty DA, et al. : Second primary tumors in patients with upper aerodigestive tract cancers: joint effects of smoking and alcohol (United States). Cancer Causes Control 14 (2): 131-8, 2003. Khuri FR, Kim ES, Lee JJ, et al. : The impact of smoking status, disease stage, and index tumor site on second primary tumor incidence and tumor recurrence in the head and neck retinoid chemoprevention trial. Cancer Epidemiol Biomarkers Prev 10 (8): 823-9, 2001. Day GL, Blot WJ, Shore RE, et al. : Second cancers following oral and pharyngeal cancers: role of tobacco and alcohol. J Natl Cancer Inst 86 (2): 131-7, 1994. Slaughter DP, Southwick HW, Smejkal W: Field cancerization in oral stratified squamous epithelium: clinical implications of multicentric origin. Cancer 6 (5): 963-8, 1953. Braakhuis BJ, Tabor MP, Leemans CR, et al. : Second primary tumors and field cancerization in oral and oropharyngeal cancer: molecular techniques provide new insights and definitions. Head Neck 24 (2): 198-206, 2002. Braakhuis BJ, Tabor MP, Kummer JA, et al. : A genetic explanation of Slaughter's concept of field cancerization: evidence and clinical implications. Cancer Res 63 (8): 1727-30, 2003. Tabor MP, Brakenhoff RH, van Houten VM, et al. : Persistence of genetically altered fields in head and neck cancer patients: biological and clinical implications. Clin Cancer Res 7 (6): 1523-32, 2001. Tabor MP, Brakenhoff RH, Ruijter-Schippers HJ, et al. : Multiple head and neck tumors frequently originate from a single preneoplastic lesion. Am J Pathol 161 (3): 1051-60, 2002. Ha PK, Califano JA: The molecular biology of mucosal field cancerization of the head and neck. Crit Rev Oral Biol Med 14 (5): 363-9, 2003. Gan SJ, Dahlstrom KR, Peck BW, et al. : Incidence and pattern of second primary malignancies in patients with index oropharyngeal cancers versus index nonoropharyngeal head and neck cancers. Cancer 119 (14): 2593-601, 2013. Ho PS, Ko YC, Yang YH, et al. : The incidence of oropharyngeal cancer in Taiwan: an endemic betel quid chewing area. J Oral Pathol Med 31 (4): 213-9, 2002. Yokoyama A, Watanabe H, Fukuda H, et al. : Multiple cancers associated with esophageal and oropharyngolaryngeal squamous cell carcinoma and the aldehyde dehydrogenase-2 genotype in male Japanese drinkers. Cancer Epidemiol Biomarkers Prev 11 (9): 895-900, 2002. Tremmel SC, Götte K, Popp S, et al. : Intratumoral genomic heterogeneity in advanced head and neck cancer detected by comparative genomic hybridization. Cancer Genet Cytogenet 144 (2): 165-74, 2003. Brieger J, Jacob R, Riazimand HS, et al. : Chromosomal aberrations in premalignant and malignant squamous epithelium. Cancer Genet Cytogenet 144 (2): 148-55, 2003. Forastiere A, Koch W, Trotti A, et al. : Head and neck cancer. N Engl J Med 345 (26): 1890-900, 2001. Lindberg R: Distribution of cervical lymph node metastases from squamous cell carcinoma of the upper respiratory and digestive tracts. Cancer 29 (6): 1446-9, 1972. Tahari AK, Alluri KC, Quon H, et al. : FDG PET/CT imaging of oropharyngeal squamous cell carcinoma: characteristics of human papillomavirus-positive and -negative tumors. Clin Nucl Med 39 (3): 225-31, 2014. Most oropharyngeal cancers are squamous cell carcinomas (SCCs). [1,2] SCCs may be noninvasive or invasive. For noninvasive SCC, the term carcinoma in situ is used. Histologically, invasive carcinomas are classified as well differentiated, moderately differentiated, poorly differentiated, or undifferentiated. SCCs are usually moderately or poorly differentiated. Grading the deep invasive margins (i.e., invasive front) of SCC may provide better prognostic information than grading the entire tumor. Human papillomavirus (HPV)-positive oropharyngeal cancers arising from the lingual and palatine tonsils are a distinct molecular-pathologic entity that is linked to infection with HPV, especially HPV16. Compared with HPV-negative tumors, HPV-positive tumors are more frequently poorly differentiated and non-keratinizing, and are strongly associated with basaloid morphology and less likely to have TP53 mutations. Immunohistochemical examination of tissues for the expression of the biomarker Ki-67, a proliferation antigen, may complement histologic grading. As a molecular indicator of epithelial dysplasia of the oropharynx, Ki-67 expression appears to correlate well with loss of heterozygosity (LOH) in tumor cells. In a retrospective study involving 43 tissue samples from 25 patients, the assessment of proliferation with Ki-67 was found to be a better surrogate for LOH than was histologic grading. Oral cavity and oropharynx. In: Rosai J, ed. : Rosai and Ackerman's Surgical Pathology. Vol. 1. 10th ed. New York, NY: Mosby Elsevier, 2011, pp. 237-264. Bryne M, Boysen M, Alfsen CG, et al. : The invasive front of carcinomas. The most important area for tumour prognosis? Anticancer Res 18 (6B): 4757-64, 1998 Nov-Dec.
Tabor MP, Braakhuis BJ, van der Wal JE, et al. : Comparative molecular and histological grading of epithelial dysplasia of the oral cavity and the oropharynx. J Pathol 199 (3): 354-60, 2003. The staging system for oropharyngeal cancer is clinical rather than pathological. It is based on the best estimate of the extent of disease before treatment. Inspection and palpation of sites (when feasible) and neck nodes. Neurologic examination of all cranial nerves. A head and neck computed tomography (CT) scan with contrast to evaluate the mandible and maxilla. Magnetic resonance imaging to evaluate the extent of disease in the soft tissues. Positron emission tomography (PET)-CT scan to assess primary, regional and distant metastatic spread. Complete endoscopy is performed after completion of other staging studies to assess the surface extent of the tumor accurately and to facilitate biopsy. This procedure is typically performed under general anesthesia, which also allows palpation for deep muscle invasion. Because of the incidence of multiple primary tumors occurring simultaneously, a careful search for other primary tumors of the upper aerodigestive tract is indicated. PET has been investigated as an imaging modality for recurrent oropharyngeal cancer. The American Joint Committee on Cancer (AJCC) has designated staging by TNM classification to define oropharyngeal cancer. Nonepithelial tumors such as those of lymphoid tissue, soft tissue, bone, and cartilage are not included. T = primary tumor; N = regional lymph nodes; M = distant metastasis. Reprinted with permission from AJCC: Pharynx. In: Edge SB, Byrd DR, Compton CC, et al., eds. : AJCC Cancer Staging Manual. 7th ed. New York, NY: Springer, 2010, pp 41-56. The explanations for superscript a is at the end of Table 8. 0 Tis, N0, M0 Tis = Carcinomain situ. I T1, N0, M0 T1 = Tumor ≤2 cm in greatest dimension. II T2, N0, M0 T2 = Tumor >2 cm but ≤4 cm in greatest dimension. III T3, N0, M0 T3 = Tumor >4 cm in greatest dimension or extension to lingual surface of epiglottis. T1, N1, M0 T1 = Tumor ≤2 cm in greatest dimension. N1 = Metastasis in a single ipsilateral lymph node, ≤3 cm in greatest dimension. T2, N1, M0 T2 = Tumor >2 cm but ≤4 cm in greatest dimension. T3, N1, M0 T3 = Tumor >4 cm in greatest dimension or extension to lingual surface of epiglottis. The explanations for superscripts a-b are at the end of Table 8. T1, N2, M0 T1 = Tumor ≤2 cm in greatest dimension. N2 = Metastasis in a single ipsilateral lymph node, >3 cm but ≤6 cm in greatest dimension, or metastasis in multiple ipsilateral lymph nodes, ≤6 cm in greatest dimension, or in bilateral or contralateral lymph nodes, ≤6 cm in greatest dimension. T2, N2, M0 T2 = Tumor >2 cm but ≤4 cm in greatest dimension. T3, N2, M0 T3 = Tumor >4 cm in greatest dimension or extension to lingual surface of epiglottis. IVB T4b, Any N, M0 T4b = Very advanced local disease. Tumor invades lateral pterygoid muscle, pterygoid plates, lateral nasopharynx, or skull base, or encases carotid artery. N2a = Metastasis in a single ipsilateral lymph node >3 cm but ≤6 cm in greatest dimension. N2b = Metastases in multiple ipsilateral lymph nodes, ≤6 cm in greatest dimension. N2c = Metastases in bilateral or contralateral lymph nodes, ≤6 cm in greatest dimension. N3 = Metastasis in a lymph node >6 cm in greatest dimension. Any T, N3, M0 TX = Primary tumor cannot be assessed. T1 = Tumor ≤2 cm in greatest dimension. T2 = Tumor >2 cm but ≤4 cm in greatest dimension. T3 = Tumor >4 cm in greatest dimension or extension to lingual surface of epiglottis. T4b = Very advanced local disease. Tumor invades lateral pterygoid muscle, pterygoid plates, lateral nasopharynx, or skull base, or encases carotid artery. a Metastases at level VII are considered regional lymph node metastases. b Mucosal extension to lingual surface of epiglottis from primary tumors of the base of the tongue and vallecula does not constitute invasion of larynx. IVC Any T, Any N, M1 TX = Primary tumor cannot be assessed. Weber AL, Romo L, Hashmi S: Malignant tumors of the oral cavity and oropharynx: clinical, pathologic, and radiologic evaluation. Neuroimaging Clin N Am 13 (3): 443-64, 2003. Wong RJ, Lin DT, Schöder H, et al. : Diagnostic and prognostic value of [(18)F]fluorodeoxyglucose positron emission tomography for recurrent head and neck squamous cell carcinoma. J Clin Oncol 20 (20): 4199-208, 2002. An optimal approach for the treatment of oropharyngeal cancer is not easily defined because no single regimen offers a clear-cut, superior-survival advantage. The literature reports various therapeutic options but does not contain reports presenting any valid comparative studies of these options. Treatment considerations should account for functional and performance status including speech and swallowing outcomes. Surgery and radiation therapy have been the standards for treatment of oropharyngeal cancer; however, outcome data from randomized trials are limited. Studies have attempted to address the question of whether to use surgery or radiation, but the studies have been underpowered. In a prospective randomized trial, 564 head and neck cancer patients with N2 or N3 disease were randomly assigned to either planned neck dissection or surveillance with positron emission tomography-computed tomography (PET/CT) scan. With a median follow up of 36 months, PET/CT surveillance resulted in fewer neck dissections compared with the surgical group (54 vs. 221), with a 2-year survival of 84.9% for the neck dissection group and 81.5% for the surgical group. The hazard ratio (HR) for death slightly favored PET/CT-guided surveillance and indicated noninferiority (upper boundary 95% confidence interval [CI] for HR < 1.50; P = .004). Local control rates of 79% (surgery with or without radiation therapy) and 76% (radiation therapy alone), (P = .087); locoregional control was 60% for surgery with or without radiation therapy versus 69% for radiation therapy alone (P = .009). 5-year survival was 49% for surgery with or without radiation therapy versus 52% (P = .2) for radiation therapy with or without neck dissection. Severe complications were 32% for the surgery group versus 3.8% for the radiation therapy group (P < .001). Fatal complications were 3.5% for the surgery group versus 0.4% for the radiation therapy group (P < .001). Local control rates of 70% (surgery with or without radiation therapy) and 68% (radiation therapy), (P = .2); locoregional control was 65% for surgery with or without radiation therapy versus 69% for radiation therapy alone (P = .1). Five-year survival was 47% for surgery with or without radiation therapy versus 43% (P = .2) for radiation therapy with or without neck dissection. Fatal complications were 3.2% for the surgery group versus 0.8% for the radiation therapy group (P < .001). For patients with early-stage disease, single-modality treatment is preferred. Historically, radiation alone has been preferred, although use of new surgical techniques, including transoral surgery and transoral robotic surgery, is increasing. Nonrandomized comparisons of transoral surgery versus primary radiation therapy suggest superior quality of life with minimally invasive surgical techniques. Historically, more-invasive surgical techniques were associated with inferior quality of life and greater morbidity. A prospective multicenter trial, ECOG-3311 (NCT01898494), evaluating transoral surgery approaches in human papillomavirus-positive oropharyngeal carcinoma with postoperative radiation dose de-escalation is currently under way. New surgical techniques for resection and reconstruction that provide access and functional preservation have extended the surgical options for patients with stage III or stage IV oropharyngeal cancer. Specific surgical procedures and their modifications are not described here because of the wide variety of surgical approaches, the variety of opinions about the role of modified neck dissections, and the multiple reconstructive techniques that may give the same results. This group of patients are managed by head and neck surgeons who are skilled in the multiple procedures available and are actively and frequently involved in the care of these patients. Positive margins or margins less than 5 mm. Extracapsular extension of a lymph node. Two or more involved lymph nodes. T3 and T4 disease (or stage III and stage IV disease). Clinically enlarged level IV-V lymph nodes secondary to tumors arising in the oral cavity or oropharynx. Two or more histopathologically involved lymph nodes without ECE. Close margins less than 5 mm. The addition of cetuximab with radiation therapy in the postoperative setting for these intermediate pathological risk factors is being tested in a randomized trial (RTOG-0920 [NCT00956007]). Patients who are smokers appear to have lower response rates and shorter survival times than do those who do not smoke while receiving radiation therapy. Counseling patients to stop smoking before beginning radiation therapy may be beneficial. Intensity-modulated radiation therapy (IMRT) has evolved over the past decade to become a standard technique for head and neck radiation therapy. IMRT allows a dose-painting technique also known as a simultaneous-integrated-boost (SIB) technique with a dose per fraction slightly higher than 2 Gy, which allows slight shortening of overall treatment time and increases the biologically equivalent dose to the tumor. The 2-year estimated locoregional failure rate was 9%. Two of four patients (50%), who had major underdose deviations, had locoregional failure compared with 3 of 49 patients (6%) without such deviations (P = .04). Maximal late toxicities with a grade of 2 or higher were skin (12%), mucosa (24%), salivary (67%), esophagus (19%), and osteoradionecrosis (6%). Longer follow-up revealed reduced late toxicity in all categories. Xerostomia grade 2 or higher was observed in 55% of patients at 6 months but was reduced to 25% of patients at 12 months and 16% of patients at 24 months. The RTOG-0022 study showed high control rates and the feasibility of IMRT at a multi-institutional level; the study also showed high tumor control rates and reduced salivary toxicity compared with previous RTOG studies. However, major target underdose deviations were associated with a higher locoregional failure rate. No toxicity difference was observed between the different dose-escalated groups. The rate of xerostomia was significantly lower in the IMRT group than in the conventional group. Fatigue was more prevalent in the IMRT group. No significant differences were seen in nonxerostomia late toxicities, locoregional control, or OS at 24 months. Radiation therapy alone with altered fractionation may be used for patients with locally advanced oropharyngeal cancer who are not candidates for chemotherapy. Altered fractionated radiation therapy yields a higher locoregional control rate compared with standard fractionated radiation therapy for patients with stage III or stage IV oropharyngeal cancer. Standard fractionation (SFX) to 70 Gy in 35 daily fractions for 7 weeks. Hyperfractionation (HFX) to 81.6 Gy in 68 twice-daily fractions for 7 weeks. Accelerated fractionation split course (AFX-S) to 67.2 Gy in 42 fractions for 6 weeks with a 2-week rest after 38.4 Gy. Accelerated concomitant boost fractionation (AFX-C) to 72 Gy in 42 fractions for 6 weeks. In a long-term analysis, the three investigational arms were compared with SFX. Only the HFX arm showed superior locoregional control and survival at 5 years compared with the SFX arm (HR, 0.79; 95% CI, 0.62-1.00; P = .05). AFX-C was associated with increased late toxicity compared with SFX. There was a significant survival benefit with altered-fractionated radiation therapy and a 3.4% absolute benefit at 5 years (HR, 0.92; 95% CI, 0.86-0.97; P = .003). Altered-fractionation radiation therapy improves locoregional control, with greater benefit shown in younger patients. HFX demonstrated a greater survival benefit (8% at 5 years) than did AFX-S (2% with accelerated fractionation without total dose-reduction and 1.7% with total dose-reduction at 5 years, P = .02). For patients with well-lateralized oropharyngeal cancer, such as a T1 or T2 tonsil primary tumor with limited extension into the palate or tongue base, and limited ipsilateral lymph node involvement without extracapsular extension, elective treatment to the ipsilateral lymph nodes results in only minimal risk of spread to the contralateral neck. For T3 and T4 tumors that are midline or approach the midline, bilateral nodal treatment is a consideration. In addition to the cervical lymph node chain, retropharyngeal lymph nodes can also be encompassed in the elective nodal treatment. Chemoradiation therapy is a standard treatment option for locally advanced (stage III and stage IV) oropharyngeal carcinoma. The subset of patients receiving chemotherapy and radiation therapy had a 4.5% absolute survival advantage. Patients receiving concomitant chemotherapy had a greater survival benefit than did those receiving induction chemotherapy. At a median follow-up of 54 months, patients treated with cetuximab and radiation therapy demonstrated significantly higher progression-free survival (hazard ratio for disease progression or death, 0.70; P = .006). Patients in the cetuximab arm experienced higher rates of acneiform rash and infusion reactions, although the incidence of other grade 3 or higher toxicities, including mucositis, did not differ significantly between the two groups. Refer to the PDQ summary on Oral Complications of Chemotherapy and Head/Neck Radiation for more information about oral toxicities. Iyer NG, Tan DS, Tan VK, et al. : Randomized trial comparing surgery and adjuvant radiotherapy versus concurrent chemoradiotherapy in patients with advanced, nonmetastatic squamous cell carcinoma of the head and neck: 10-year update and subset analysis. Cancer 121 (10): 1599-607, 2015. Mehanna H, Wong WL, McConkey CC, et al. : PET-CT Surveillance versus Neck Dissection in Advanced Head and Neck Cancer. N Engl J Med 374 (15): 1444-54, 2016. Parsons JT, Mendenhall WM, Stringer SP, et al. : Squamous cell carcinoma of the oropharynx: surgery, radiation therapy, or both. Cancer 94 (11): 2967-80, 2002. Harrison LB, Zelefsky MJ, Armstrong JG, et al. : Performance status after treatment for squamous cell cancer of the base of tongue--a comparison of primary radiation therapy versus primary surgery. Int J Radiat Oncol Biol Phys 30 (4): 953-7, 1994. Mendenhall WM, Morris CG, Amdur RJ, et al. : Definitive radiotherapy for squamous cell carcinoma of the base of tongue. Am J Clin Oncol 29 (1): 32-9, 2006. Chen AM, Daly ME, Luu Q, et al. : Comparison of functional outcomes and quality of life between transoral surgery and definitive chemoradiotherapy for oropharyngeal cancer. Head Neck 37 (3): 381-5, 2015.
Cooper JS, Pajak TF, Forastiere AA, et al. : Postoperative concurrent radiotherapy and chemotherapy for high-risk squamous-cell carcinoma of the head and neck. N Engl J Med 350 (19): 1937-44, 2004. Bernier J, Domenge C, Ozsahin M, et al. : Postoperative irradiation with or without concomitant chemotherapy for locally advanced head and neck cancer. N Engl J Med 350 (19): 1945-52, 2004. Bernier J, Cooper JS, Pajak TF, et al. : Defining risk levels in locally advanced head and neck cancers: a comparative analysis of concurrent postoperative radiation plus chemotherapy trials of the EORTC (#22931) and RTOG (# 9501). Head Neck 27 (10): 843-50, 2005.
Cooper JS, Zhang Q, Pajak TF, et al. : Long-term follow-up of the RTOG 9501/intergroup phase III trial: postoperative concurrent radiation therapy and chemotherapy in high-risk squamous cell carcinoma of the head and neck. Int J Radiat Oncol Biol Phys 84 (5): 1198-205, 2012. Allal AS, de Pree C, Dulguerov P, et al. : Avoidance of treatment interruption: an unrecognized benefit of accelerated radiotherapy in oropharyngeal carcinomas? Int J Radiat Oncol Biol Phys 45 (1): 41-5, 1999. Browman GP, Wong G, Hodson I, et al. : Influence of cigarette smoking on the efficacy of radiation therapy in head and neck cancer. N Engl J Med 328 (3): 159-63, 1993. Eisbruch A, Harris J, Garden AS, et al. : Multi-institutional trial of accelerated hypofractionated intensity-modulated radiation therapy for early-stage oropharyngeal cancer (RTOG 00-22). Int J Radiat Oncol Biol Phys 76 (5): 1333-8, 2010. Leclerc M, Maingon P, Hamoir M, et al. : A dose escalation study with intensity modulated radiation therapy (IMRT) in T2N0, T2N1, T3N0 squamous cell carcinomas (SCC) of the oropharynx, larynx and hypopharynx using a simultaneous integrated boost (SIB) approach. Radiother Oncol 106 (3): 333-40, 2013. Buettner F, Miah AB, Gulliford SL, et al. : Novel approaches to improve the therapeutic index of head and neck radiotherapy: an analysis of data from the PARSPORT randomised phase III trial. Radiother Oncol 103 (1): 82-7, 2012. Gulliford SL, Miah AB, Brennan S, et al. : Dosimetric explanations of fatigue in head and neck radiotherapy: an analysis from the PARSPORT Phase III trial. Radiother Oncol 104 (2): 205-12, 2012. Kohler RE, Sheets NC, Wheeler SB, et al. : Two-year and lifetime cost-effectiveness of intensity modulated radiation therapy versus 3-dimensional conformal radiation therapy for head-and-neck cancer. Int J Radiat Oncol Biol Phys 87 (4): 683-9, 2013. Gupta T, Agarwal J, Jain S, et al. : Three-dimensional conformal radiotherapy (3D-CRT) versus intensity modulated radiation therapy (IMRT) in squamous cell carcinoma of the head and neck: a randomized controlled trial. Radiother Oncol 104 (3): 343-8, 2012. Nutting CM, Morden JP, Harrington KJ, et al. : Parotid-sparing intensity modulated versus conventional radiotherapy in head and neck cancer (PARSPORT): a phase 3 multicentre randomised controlled trial. Lancet Oncol 12 (2): 127-36, 2011. Fu KK, Pajak TF, Trotti A, et al. : A Radiation Therapy Oncology Group (RTOG) phase III randomized study to compare hyperfractionation and two variants of accelerated fractionation to standard fractionation radiotherapy for head and neck squamous cell carcinomas: first report of RTOG 9003. Int J Radiat Oncol Biol Phys 48 (1): 7-16, 2000. Beitler JJ, Zhang Q, Fu KK, et al. : Final results of local-regional control and late toxicity of RTOG 9003: a randomized trial of altered fractionation radiation for locally advanced head and neck cancer. Int J Radiat Oncol Biol Phys 89 (1): 13-20, 2014. Baujat B, Bourhis J, Blanchard P, et al. : Hyperfractionated or accelerated radiotherapy for head and neck cancer. Cochrane Database Syst Rev (12): CD002026, 2010. Murthy V, Narang K, Ghosh-Laskar S, et al. : Hypothyroidism after 3-dimensional conformal radiotherapy and intensity-modulated radiotherapy for head and neck cancers: prospective data from 2 randomized controlled trials. Head Neck 36 (11): 1573-80, 2014. O'Sullivan B, Warde P, Grice B, et al. : The benefits and pitfalls of ipsilateral radiotherapy in carcinoma of the tonsillar region. Int J Radiat Oncol Biol Phys 51 (2): 332-43, 2001. Denis F, Garaud P, Bardet E, et al. : Final results of the 94-01 French Head and Neck Oncology and Radiotherapy Group randomized trial comparing radiotherapy alone with concomitant radiochemotherapy in advanced-stage oropharynx carcinoma. J Clin Oncol 22 (1): 69-76, 2004. Adelstein DJ: Oropharyngeal cancer: the role of chemotherapy. Curr Treat Options Oncol 4 (1): 3-13, 2003. Pignon JP, le Maître A, Maillard E, et al. : Meta-analysis of chemotherapy in head and neck cancer (MACH-NC): an update on 93 randomised trials and 17,346 patients. Radiother Oncol 92 (1): 4-14, 2009. Bonner JA, Harari PM, Giralt J, et al. : Radiotherapy plus cetuximab for squamous-cell carcinoma of the head and neck. N Engl J Med 354 (6): 567-78, 2006. Curran D, Giralt J, Harari PM, et al. : Quality of life in head and neck cancer patients after treatment with high-dose radiotherapy alone or in combination with cetuximab. J Clin Oncol 25 (16): 2191-7, 2007. Haddad R, O'Neill A, Rabinowits G, et al. : Induction chemotherapy followed by concurrent chemoradiotherapy (sequential chemoradiotherapy) versus concurrent chemoradiotherapy alone in locally advanced head and neck cancer (PARADIGM): a randomised phase 3 trial. Lancet Oncol 14 (3): 257-64, 2013. Cohen EE, Karrison TG, Kocherginsky M, et al. : Phase III randomized trial of induction chemotherapy in patients with N2 or N3 locally advanced head and neck cancer. J Clin Oncol 32 (25): 2735-43, 2014. Hitt R, Grau JJ, López-Pousa A, et al. : A randomized phase III trial comparing induction chemotherapy followed by chemoradiotherapy versus chemoradiotherapy alone as treatment of unresectable head and neck cancer. Ann Oncol 25 (1): 216-25, 2014. The choice of treatment is dictated by the anticipated functional speech and swallowing and cosmetic outcome of the treatment options and by the available expertise of the surgeon or radiation oncologist. Treatment is individualized for each patient. Radiation therapy using standard fractionation. Check the list of NCI-supported cancer clinical trials that are now accepting patients with stage I oropharyngeal cancer and stage II oropharyngeal cancer. The list of clinical trials can be further narrowed by location, drug, intervention, and other criteria. Neoadjuvant chemotherapy followed by concurrent chemoradiation therapy. Chemoradiation therapy with immunotherapy. RTOG 3504 (NCT02764593) is evaluating concurrent chemoradiation therapy with nivolumab in patients with intermediate- to high-risk head and neck cancer. Treatment de-intensification using radiation dose de-escalation is being studied in NRG HN002 (NCT02254278). Treatment de-intensification using transoral surgery followed by radiation dose de-escalation is being studied in ECOG 3311 (NCT01898494). Check the list of NCI-supported cancer clinical trials that are now accepting patients with stage III oropharyngeal cancer. The list of clinical trials can be further narrowed by location, drug, intervention, and other criteria. Horiot JC, Le Fur R, N'Guyen T, et al. : Hyperfractionation versus conventional fractionation in oropharyngeal carcinoma: final analysis of a randomized trial of the EORTC cooperative group of radiotherapy. Radiother Oncol 25 (4): 231-41, 1992. Bourhis J, Lapeyre M, Tortochaux J, et al. : Phase III randomized trial of very accelerated radiation therapy compared with conventional radiation therapy in squamous cell head and neck cancer: a GORTEC trial. J Clin Oncol 24 (18): 2873-8, 2006. Overgaard J, Hansen HS, Specht L, et al. : Five compared with six fractions per week of conventional radiotherapy of squamous-cell carcinoma of head and neck: DAHANCA 6 and 7 randomised controlled trial. Lancet 362 (9388): 933-40, 2003. Overgaard J, Mohanti BK, Begum N, et al. : Five versus six fractions of radiotherapy per week for squamous-cell carcinoma of the head and neck (IAEA-ACC study): a randomised, multicentre trial. Lancet Oncol 11 (6): 553-60, 2010. Olmi P, Crispino S, Fallai C, et al. : Locoregionally advanced carcinoma of the oropharynx: conventional radiotherapy vs. accelerated hyperfractionated radiotherapy vs. concomitant radiotherapy and chemotherapy--a multicenter randomized trial. Int J Radiat Oncol Biol Phys 55 (1): 78-92, 2003. Semrau R, Mueller RP, Stuetzer H, et al. : Efficacy of intensified hyperfractionated and accelerated radiotherapy and concurrent chemotherapy with carboplatin and 5-fluorouracil: updated results of a randomized multicentric trial in advanced head-and-neck cancer. Int J Radiat Oncol Biol Phys 64 (5): 1308-16, 2006. Ensley J, Crissman J, Kish J, et al. : The impact of conventional morphologic analysis on response rates and survival in patients with advanced head and neck cancers treated initially with cisplatin-containing combination chemotherapy. Cancer 57 (4): 711-7, 1986. Pfister DG, Harrison LB, Strong EW, et al. : Organ-function preservation in advanced oropharynx cancer: results with induction chemotherapy and radiation. J Clin Oncol 13 (3): 671-80, 1995. Surgical resection, if technically feasible and the tumor does not respond to radiation therapy. Radiation therapy, if the tumor is not completely removed by surgery and curative doses of radiation have not been given previously. A second surgery, if the tumor was not completely removed initially and if technically feasible. Chemotherapy, for unresectable locoregionally recurrent disease. Additional radiation therapy using conventionally fractionated radiation therapy, or hyperfractionated radiation therapy (HFX) with concomitant chemotherapy. Stereotactic body radiotherapy with concurrent cetuximab. Clinical trials evaluating additional radiation therapy using HFX with concomitant chemotherapy, targeted therapy, stereotactic body radiation therapy, or immunotherapy. Check the list of NCI-supported cancer clinical trials that are now accepting patients with recurrent oropharyngeal cancer. The list of clinical trials can be further narrowed by location, drug, intervention, and other criteria. Wong LY, Wei WI, Lam LK, et al. : Salvage of recurrent head and neck squamous cell carcinoma after primary curative surgery. Head Neck 25 (11): 953-9, 2003. Vikram B, Strong EW, Shah JP, et al. : Intraoperative radiotherapy in patients with recurrent head and neck cancer. Am J Surg 150 (4): 485-7, 1985. Spencer SA, Harris J, Wheeler RH, et al. : RTOG 96-10: reirradiation with concurrent hydroxyurea and 5-fluorouracil in patients with squamous cell cancer of the head and neck. Int J Radiat Oncol Biol Phys 51 (5): 1299-304, 2001. Vargo JA, Ferris RL, Ohr J, et al. : A prospective phase 2 trial of reirradiation with stereotactic body radiation therapy plus cetuximab in patients with previously irradiated recurrent squamous cell carcinoma of the head and neck. Int J Radiat Oncol Biol Phys 91 (3): 480-8, 2015. Tortochaux J, Tao Y, Tournay E, et al. : Randomized phase III trial (GORTEC 98-03) comparing re-irradiation plus chemotherapy versus methotrexate in patients with recurrent or a second primary head and neck squamous cell carcinoma, treated with a palliative intent. Radiother Oncol 100 (1): 70-5, 2011. This summary was comprehensively reviewed, extensively revised, and reformatted. This PDQ cancer information summary for health professionals provides comprehensive, peer-reviewed, evidence-based information about the treatment of oropharyngeal cancer. It is intended as a resource to inform and assist clinicians who care for cancer patients. It does not provide formal guidelines or recommendations for making health care decisions.